We found 169 results matching your criteria. The Idea of the Elliptical Trainer was to mimic the natural running movement on a machine that would provide a low impact workout easy on the joints. The Elliptical Cross-Trainer is similar to a treadmill in terms of its exertion on the leg muscles and the heart, but its impact on the joints, knees, and back is a fraction to the impact of running outdoors or on a treadmill. Elliptical Cross-Trainers come in many varieties. Some have incline features to target different leg muscles. Some have moving arms to target upper body muscles. Some have adjustable strides to accommodate exercisers of different heights. Almost all ellipticals allow the exerciser to vary the resistance. 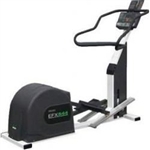 Click here to read more about elliptical crosstrainers. How to Improve Your Elliptical Workout! Top 5 Most Innovative Cardio Machines, including the Precor AMT!